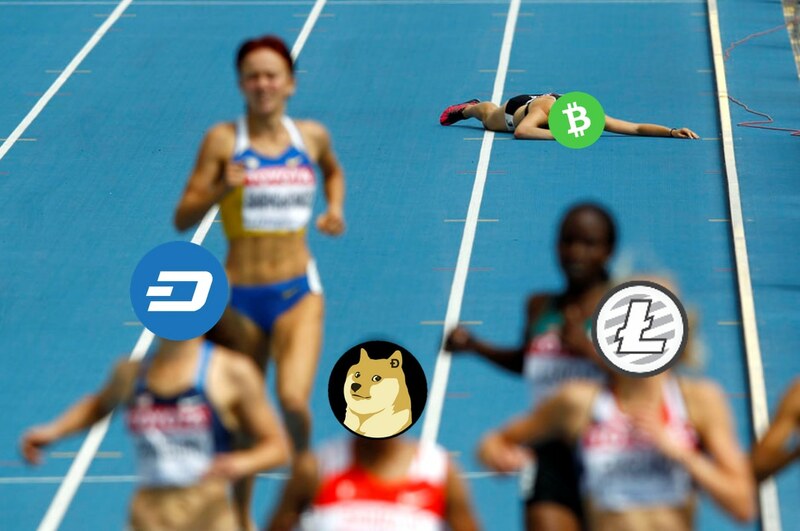 Altcoins including Dogecoin (DOGE), Litecoin (LTC) and DASH have outperformed Bitcoin Cash (BCH) in network activity in the month of December. The Bitcoin Cash network forked into two chains: Bitcoin Cash ABC (BCH) and Bitcoin SV (BSV) on November 15th this year. The fork drama has adversely affected the BCH network, even though the two chains together were on the same network once now they are considered as two completely different networks (similar logic is applied to all BTC forks also). The main reason why BCH forked off from the original BTC chain was to be peer to peer cash for the world with lower fees and on chain scalability. But it seems that Bitcoin Cash has fallen short of this vision and has even underperformed some of the altcoins like Dogecoin, Litecoin, and Dash. Bitcoin Cash (BCH) had lower on chain transactions in the past month as compared to Dogecoin, Litecoin, and Dash. In fact, Dogecoin has processed four times as many payments as Bitcoin Cash. Blockmanity had previously reported about Dogecoin outperforming Bitcoin Cash even during the hard fork drama in November. The Crypto research publication Longhash compares the transaction data in the past month among Bitcoin Cash, Dash, Dogecoin and Litecoin. Bitcoin Cash also has lesser active addresses than all of three Altcoins. At a point in time, the BCH network had outpaced the BTC network in miner support and was worth a good chunk of the entire Crypto market cap. A year and a half later, BCH is nowhere even near in matching the BTC network in price or network value. The Bitcoin network processes over 20 times the transactions and is 25 times larger than BCH in terms of market capitalization. There is a reason why other networks have not even come close to replace Bitcoin (BTC) even though they have better transaction speed and lower fees, and that has to do with the store of value aspect of a currency. As volatile as it is, Bitcoin is still less volatile when compared to the other coins. Bitcoin has existed longer and has more liquidity and brand value than any other Cryptocurrency. This is not simply replaced by lower transaction fees or faster transactions and evidence for this is clear.